So much for Twitter as the “second screen” and all its TV partnerships – Google announced this morning that it has bagged a deal with one of the top interactive TV shows in the U.S.: Fox’s “American Idol.” Starting with tonight’s live performance show, viewers will be able to vote for their favorite singers directly from Google. You don’t have to care at all about “American Idol” to grasp the ramifications of this news. Despite Twitter, Facebook and a million other smaller startups’ attempts to claim their app will be the default platform TV viewers casually browse, a phone or tablet in their laps, while watching television, Google got there simply by throwing its weight around. It’s interesting what Google can do when it spares a moment from building face computers that get you beat up in bars, right? The experience will also include additional content, including links to “Idol” videos on YouTube, tools to share your thoughts on Google+, and more. Google as the second screen is a role the company likely heavily plays today, as viewers search for things they’re seeing on a TV program, the news, or a product in a TV ad, but the company has never really taken advantage of that position until now. 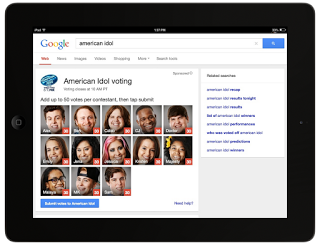 It’s also worth noting that this trial gives Google the opportunity to test how well it can perform as a live voting platform, which is something it could use for other business purposes, including not only interactive TV, but any situation where polling a large audience is required. It’s also worth noting that Facebook, too, will play a role in the forthcoming shows. The company will power visual, on-air voting progress updates based on real-time East Coast voting data during some live shows,”Idol” producers says. As for Twitter? They get thrown a bone at the very bottom of this PR: “Follow the series on Twitter @AmericanIdol and join the discussion using #idol.” OK then.